It's not unusual, in our fast-paced lives, for folks to miss the first day of fast and abstinence in Lent - which is Ash Wednesday, this year on March 1! This post is an Intro to Fast and Abstinence 101. Isn't this all just a lot of rules? Like many rules, those below are rather detailed in their wording and that’s at least in part to answer ahead of time the many questions that such rules often occasion. More important than the details of rules, however, is the spirit with which we comply with them. Most of us have some familiarity with dietary restrictions that are part of the religious life of peoples of other faiths and we admire the fidelity that keeps them loyal to their traditions. Their practice can teach us how such such customs make the observance of holy days and seasons more personally concrete. So, what's the "spirit" that should stand behind fasting? to fast from guilt and to feast on the mercy of God. Such exercises as fasting cannot have their proper effect unless our motives for practicing them spring from personal meditation. We have to think of what we are doing, and the reasons for our actions must spring from the depths of our freedom and be enlivened by the transforming power of Christian love. Otherwise, our self-imposed sacrifices are likely to be pretenses, symbolic gestures without real interior meaning. Sacrifices made in this formalistic spirit tend to be mere acts of external routine performed in order to exorcise interior anxiety and not for the sake of love. In that case, however, our attention will tend to fix itself upon the insignificant suffering which we have piously elected to undergo, and to exaggerate it in one way or another, either to make it seem unbearable or else to make it seem more heroic than it actually is. Sacrifices made in this fashion would be better left unmade. It would be more sincere as well as more religious to eat a full dinner in a spirit of gratitude than to make some minor sacrifice a part of it, with the feeling that one is suffering martyrdom. As you can see, the fasting we do and our abstaining from particular foods is meant to be an encouragement of and a sign of what's happening in our hearts. In fact, the spirit of fasting suggested above is much more demanding than the dietary laws for the season of Lent. You might be personally "fasting and abstaining" from particular things during Lent, the following is what's expected of all Catholics during this season. are expected to abstain from eating meat on this day. (liquids between meals, however, are allowed). on the Fridays of Lent. should take precedence over the practices of fast and abstinence. 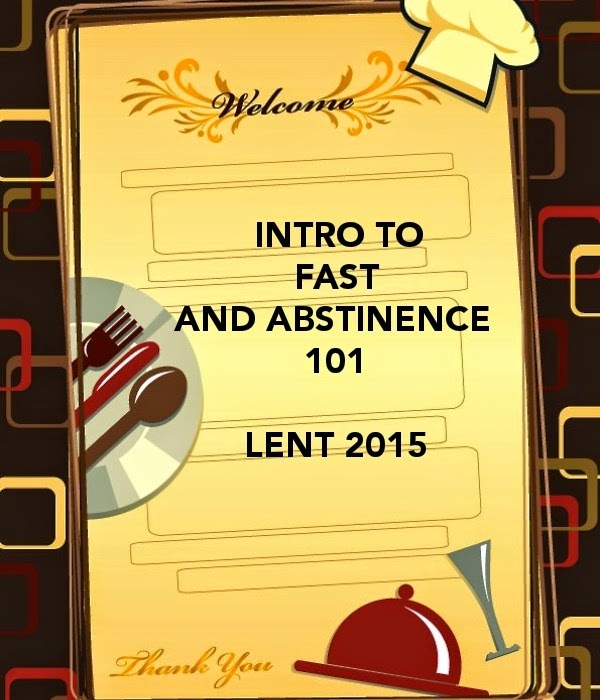 Fast and abstinence should never jeopardize one’s physical health. I think we are doing no penance by a "meatless" Lenten Friday. All manner of seafood is available and legal. So, I think we should go for grains, nuts, vegetables, salads, fruits, broths, non-alcoholic liquids and water. No animal flesh, land or sea. In total agreement, Tim! I was out to dinner last night (Friday) and realized that although I had no meat, I enjoyed my fish appetizer and entree MORE than if I'd had meat - no sacrifice! Gotta change this for the remaining Fridays.